The music of Nonato Luiz is a kind of erudite and popular music, got the beauty of the baroque counterpoint and the magic of the Brazilian northeast color; got the surprise of the modern harmony and the sweetness of the song. Few composers got the competence to unites it all and turn a feeling of life into esthetic solutions for the guitar. If the guitar is our most popular instrument, in other way, is an instrument that got difficult techniques. It’s like the guitar is used only to follow the voice, or another solo instrument. Unhappily this is our culture. On the other side, happily composers like Nonato Luiz exists, who shows up from the virtuous land of Mangabeira, to play Esse comboio de cordas que se chama o coracao. And is exactly by the heart that Nonatyo Luiz catch the imprudent of the guitar techniques. But there are those who, even following they hearts, understand the difficulty of this technics. 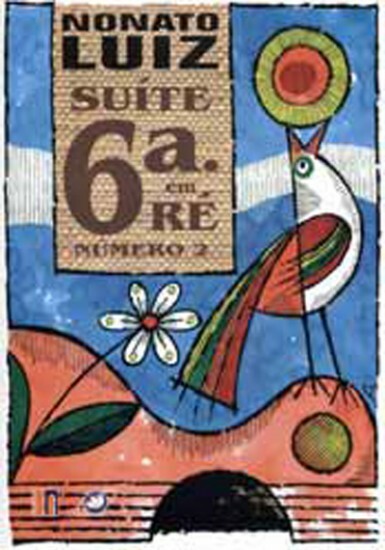 The Suite Six ta em re, no 2 is a good example for these two things: a strong heart and an enviable virtuosi. It’s a work that unites the erudite, by the structure and harmony (the case of A Concordancia), and the popular, by some riffs (case of Reflexoes Nordestinas): that’s the way Nonato Luiz does his compositions. After all, the execution of this work require a lot of study. And the best is that work is now available in score, for those who got the braveness to sit and study. This album, with no doubt, is a great contribution for the guitar students. The digitization are very good got logic the five movements are a rare beauty. In many moments, we can note the brazilian northeast character and the universal lyricism presents. This work is universal. Who want to be universal, take care of your home. * Pardal is a musician, composer and literature’s teacher of Federal University of Ceara.